iTranslate Voice is a productivity app created by Sonico Mobile. It costs $1.99 and is available on the iPhone, iPad, and iPod touch. Please note that there are two iTranslate apps from Sonico on the app market: iTranslate Voice and iTranslate. During this review iTranslate Voice may be referred to as “iTranslate,” for simplicity sake, but it is not referring to the iTranslate app itself. 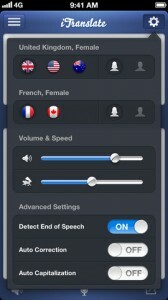 The iTranslate app supports 60+ languages and doesn’t have voice recognition. iTranslate Voice combines powerful speech recognition algorithms with accurate translations to help people communicate like never before. This app lets you speak into your phone in any of the 36 supported languages, and then it translates your sentences into your desired language. If you’re an American traveling to Mexico for example, you can speak English into iTranslate, and iTranslate will reply with the Spanish translation. 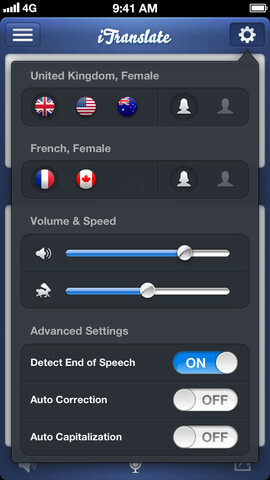 In fact iTranslate will “speak” the Spanish using the iDevice’s speakers or headphones. This is helpful because the person speaking the other language doesn’t have to peek at your phone to see what you’re trying to say. A Spanish speaker would listen to the Spanish translation, and then they could reply back into the phone in Spanish, which would then be translated back into English. This app even works if you’re in France, Germany, Greece, Hungary, etc. However, Wi-Fi or 3G is required for iTranslate to recognize voice and to translate sentences. I’ve never seen an app that could be more valuable to a travelling person then iTranslate Voice. You could end up in Egypt, Sweden, or Japan and this app would still be useful to you. Also, here’s a list of all the supported languages. While testing iTranslate Voice I was not able to find any glitches or shortcomings. There are also no in-app advertisements. For $1.99, you’d be crazy not to buy this app. With over 10,000 raving reviews on the app market you can rest assured that iTranslate Voice is really worth it.